Lawyer IN Arizona said i can't sue and now i fear i might have missed my deadline. Lawyer never told me i can sue without a lawyer pro-se to exercise my right. (Help form is seen at the conclusion of this informative page everyone)Must be implemented(completed)before you call to begin. ARIZONA DCS worker's are the absolute worse. Right up there with New Jersey DYFS, DCF DCP&P, NC VA DSS, and California abhorrent DCFS... Up to you to file your suit in a timely fashion and continue while suit is pending to #learn at the pro-se level. You're well within your right,to sue for civil right damages. If our owner/founder who made media news headlines for years, insofar as filing her suit without a "lawyer"by deadline pro-se and winning at the level most have not, then you're able to do and learn the same,as the owner,Ms.S.Melendez." Her direct extension is 806 or 620. 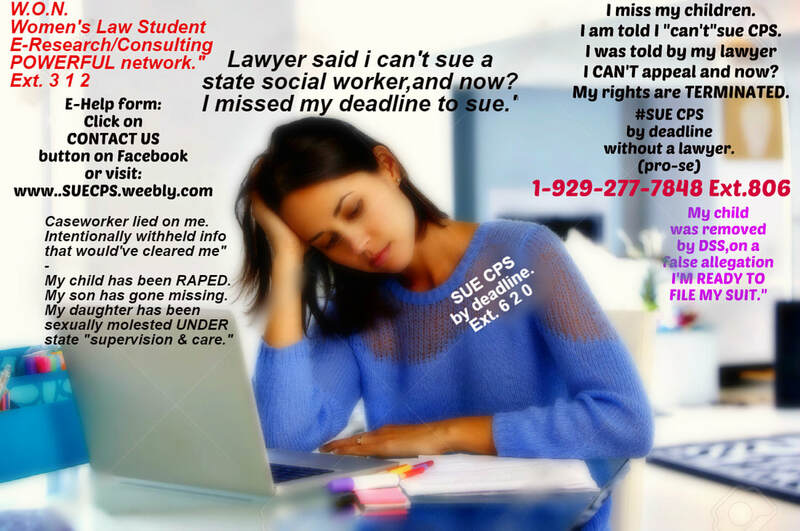 ​Then,call in 15 min.to 1 hr., same day for your session 1-on-1.Good luck suing timely abhorrent worker @ DCS.